Trailer 3 made Terminator Salvation look like it was going to be the best Terminator film yet. It didn’t turn out that way, though. In my opinion, it was a decent film, but it could have been better. One of the main reasons for that was Marcus’ screen time. This edit will focus more on Connor. I cut out as much of Marcus as I could. You won’t know for sure that he’s a machine until he gets damaged by a magnetic mine. I removed the 2003 scene and cut out Marcus skipping across the water. The only scenes that allude to him being a machine are when we see him laying down in the beginning. I’ve added in some new music; a lot of it is digital/electronica, which I think suits this type of film. Many great sci-fi flicks had synth soundtracks including the 1st two Terminators. I hope I, at least, succeeded in making the film watchable for those who didn’t like it. I took a bit of Sarah Connor’s voice-over from T2, so Judgment Day occurs on the original date: 8/29/97. I’m not really bothered by the use of usb ports, because in less than 10 years, they’ll be seeing plasma rifles. Then there’s Marcus’ age. - Director’s Cut was used to create this fan edit. - Added Sarah Connor’s voiceover right before the T1 attacks. Soldiers don’t talk about how it’s too quiet. - John talks about the T800 at the beginning of the sub scene. Doesn’t say T800. Taken from 4min promo. Couldn’t do a whole lot with it. - “Does it work” line cut. - Barnes does not say “My brother”. We find out later. Makes the character more worthy of attention. - Some of what Sarah said on the tapes has been removed leaving gaps of silence for dramatic effect. To much info, too. 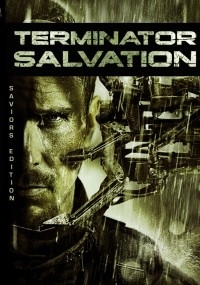 I am one of the few, who really enjoyed Terminator Salvation. I loved the incredible amount of references and nods to the predecessors, especially because T2 did the very same thing with T1, yet it did not feel too artificial in T4. For a Terminator fan it was obvious very soon (or from the very beginning) that Marcus was some kind of Terminator, yet the final revelation was still strong enough to convince me and have me entertained. I liked it how they displayed the terminator universe not just at night and in huge battles, but in broad daylight. The one thing that bothered me was that the original movie had too much action and was overall too loud, which annoyed me after a while. the movie starts with the original beginning but then radically switches to a new take with self created continuing credits (it is Brad FIEDEL by the way). This was interesting, yet not too convincingly done as these credits played too long in the movie and made it almost feel like a TV show. The plot unfolds really well after that for the most part, only a few times edits felt forced, like John Connor in the ocean or Marcus dropping from the transport. When Serena Kogan is finally introduced it still feels forced, even though Scaperat took care by keeping the dream sequence, yet when she has her skynet appearance I got the feeling there was way more to it. The ending worked kind of well, yet it did not have any magic to it (just like the original). The removed scenes were overall a great choice and were not missed at all. Since I only watched T4 one time so far, I can only think that most of them would have annoyed me a lot on the second viewing. Especially toning down young Kyle Reese was a very good idea. The end credits are the original end credits with new music. I would have probably listened if there were self made end credits, but the music itself was not interesting enough for me to do that. Overall I was mildly entertained by this version but also not excited. The original had more impact to me without being great. i think this is not the final word on possible T4 edits, but it already has a few interesting approaches. I watched the DVD, so I was expecting great quality, which I did not get. Some scenes in the dark had artifacts, some scenes seemed to have a blue filter that felt annoying. Overall the image quality was ok, but not really DVD quality. audio quality was good. I still found the movie just like the original too loud in parts (in the mix of action music and explosions). 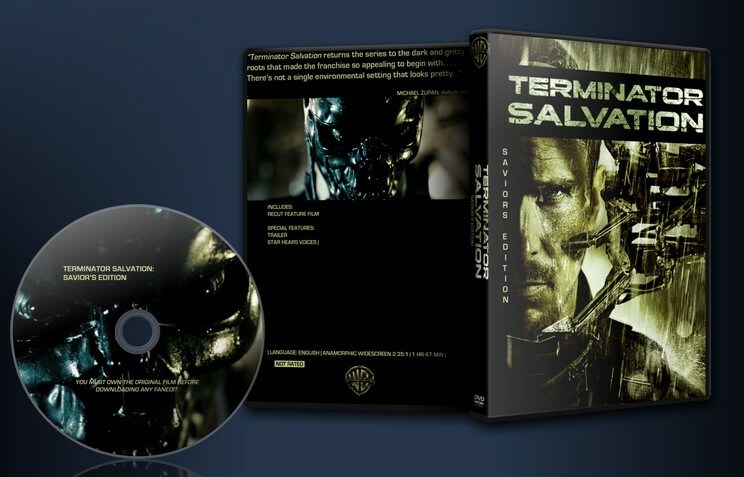 The DVD comes with a still main menu with the terrible main theme from T4. The image chosen is not a good one IMO and the yellow font and links also do not support the mood of the movie. There is a trailer and a deleted scene thingie as extras, both of which are ok, but not too much fun to watch either. The starting credits were partially self created, yet I did not see the fanedit title or the editor name (unlike in the trailer). There is cover art and disc art, both are ok.
there is room for improvement, yet an overall ok presentation. Can be enjoyed, but I am still hopeful for a better T4 fanedit. The original movie is rated 6.9/10 on IMDB at the moment. So I would rate this fanedit 8/10 since this version is definitly better than the original ! Like juk I had darkness issue with 2 scÃ¨nes (when they try the signal on the flying machine, and when Connor arrive at Skynet base) but this did not impact on my rating. Contrary to spelledaren and like juk I think the music changes are excellent. However the end of the movie still feels like a bad remake a Terminator 2, because of the use of molten metal and cold to fight the terminator. If that scene was gone I would have rated this fanedit 8.5/10!